‘That sounds like a film’, Rachel responded when I told her I was off to the archive again, ‘chasing Sidney in Kent’. That’s true. In fact, I am surprised nobody ever did make a film about Algernon Sidney – or at least I am not aware of one. 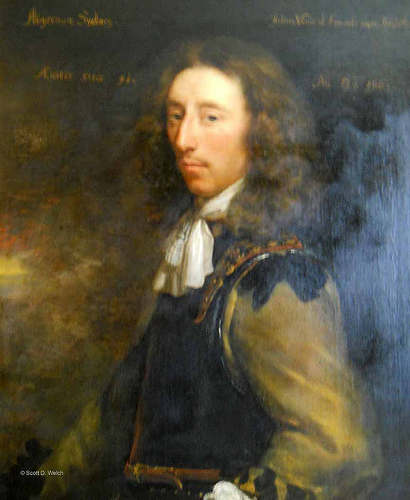 He clearly is the sexiest of the English Civil War republicans I have been studying for the past few years, and this is not just down to his long wavy hair and striking profile. This lack of place and position in a hierarchical world ruled by monarchs might also have been one reason why Sidney did not return to England after the Restoration of the Stuarts in 1660, but, after a diplomatic mission to Sweden and Denmark, kept erring around on the Continent, attempting to raise an army to invade England and restore the republic. All his life Sidney fought for a world in which merit counted, not birth. Sidney’s life is remarkably well documented. Numerous books and shorter pieces have been written about him. Yet, mystery still hangs over his long period abroad. He first travelled south to Italy via Germany and back up north again via Switzerland and the United Provinces before finally settling in the south of France. Almost nothing is known about his personal life. He might have had a wife and a daughter, but the sources are inconclusive. He certainly had an interesting social life. Sidney knew men of the Fronde, he had radical contacts all over Europe, and he tried to enlist both the Grand Pensionary of Holland and the King of France into schemes to invade England from abroad. Yet, despite all those years of plotting on the Continent, it was finally his writing that got Sidney into trouble. When he was implicated in the 1683 Rye House Plot to kill Charles II, Sidney’s manuscript of the Discourses, seized on his arrest, was employed as the second ‘witness’ to proof a charge of treason against him. Some twenty years after many of his fellow republicans had lost their lives in Tyburn, Sidney was beheaded on 17 December 1683. His Discourses were published posthumously in 1698. This entry was posted in seventeenth century and tagged Algernon Sidney; Jonathan Scott; John Carswell, republicanism; republicans. Bookmark the permalink.